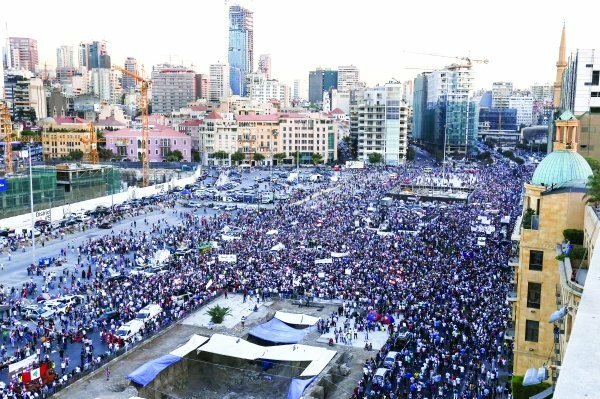 Thousands of Lebanese people took Beirut streets in protest at a government they say is corrupt and ineffective. Security was high amid fears the demonstrations could turn violent, as similar protests did last weekend. Organizers of Saturday’s mostly peaceful rally demanded the environment minister resign within 72 hours. The government’s failure to solve the crisis over the disposal of rubbish led to the “You Stink” campaign. The protesters have been calling on the government to hold snap parliamentary elections, and also want the interior minister held to account for excessive force by police at least week’s protests. They poured into a major square in central Beirut, waving Lebanese flags and shouting anti-government slogans. Many wore t-shirts with the words “You Stink”. Some were playing music and singing. The rally was mostly peaceful although a small group of masked youths tried to break through barbed wire to reach the prime minister’s office. They set fire to rubbish and pelted police officers with stones and plastic bottles. Barricades and barbed wire were installed around government buildings as security was increased ahead of the rally. Amnesty International urged the security services to show restraint and called for an investigation into last week’s violence. Rubbish has been piling up on the streets of Beirut since Lebanon’s largest landfill shut down last month with no ready alternative. This led to the creation of the You Stink movement, which blames political paralysis and corruption for the failure to resolve the crisis. The cabinet failed to reach agreement on August 25 on a way forward, saying the fees quoted by private waste management companies were too great. Lebanon has been without a president for more than a year, while members of parliament have extended their own terms until 2017 after failing to agree on a law on fresh elections. The conflict in neighboring Syria has also exacerbated political and sectarian divisions, and resulted in the arrival of 1.1 million refugees, putting a strain on the economy and public services.